With just 20 or so days to go until we meet our little Bramble Bump, he is growing like a champ. Our last ultrasound showed him at 5 pounds, 6 ounces and that was 10 days ago! He should be over 6 pounds now. My waist is currently 41″ around and I’ve gained 26 pounds for the pregnancy (thus far – we still have a little bit to go!). I’m still soaping every day and happily working more than full time (which is easy because I love my job!). In the above photo, I’m whipping up a batch of our Liquid Castile Soap Base to test out fragrance clarity (for future reference, Lavender 40/42, Oatmeal, Milk & Honey and Energy all stay clear but you do need to heat the Lavender to clarify it). I’m still working out regularly but have been reduced to prenatal yoga, pilates and walking. But, I am thankful to have mobility and am relishing our last few weeks before life changes (and hopefully improves) forever. Just wanted to say how cute you look! You look great by the way! You’ll be back to your slim self in no time. And the fact that you are still doing so much leads me to believe you will be able to juggle a baby and a business without going insane. No baby yet…but any day now. EEK! Hi! I like it so much all your projects and I learn a lot with all your videos. I’m an artisan here in my country Puerto Rico (Soaps, lotions, body scrubs, lip balms and candles). This is a great adventure!!! Congratulations and go ahead! Blessings! Aww! The bump report! I love these! Can’t wait to see your little one! My fingers are crossed for the 18th… that’s my bday! Having two boys I must say with the rest of the family having all girls. I enjoyed and still do being there number one gal. 🙂 They are both grown now but they still make me feel special and I loved having boys ( but would love some grand girl babies). Enjoy. I always thought I’d have a girl and a boy (like me and my brother) but obviously, someone (be it my husband or God!) had other plans for that girl/boy plan so I’m happily rolling along with that and am now telling myself we’ll end up with two boys =) I just want a healthy baby and don’t care either way (honestly, really truly). You look amazing! My husband and I agree that happily pregnant women are the beautiful in the world… there is just this glow about them! Congratulations, and you know the rest of us also can’t wait to “meet” the new BrambleBoy. Please keep us all posted when possible… I know I’ll be waiting to see the little one when things have all calmed down for you! Congrats! I get to hopefully find out the gender tomorrow so excited! I am having a August baby! Just found out it’s a girl! I used your onsie mold to make my announcement yesterday on my Facebook!! Now they will make great baby shower gratitude gifts! LOL yeah the ultrasound was obvious for us! I went with the oatmeal m&p and pink piping with Linden Blossom scent! I am 21 weeks today! Now the battle to pick a nursery theme! We went with a farm theme but it was a tough call. That’s a beautiful bump and you are definitely glowing. You look radiant! Best wishes to you, DH and the lil one. Very exciting! Yay! Bramble prince is on his way! Praying for a smooth, safe, natural delivery! Peach Mango Salsa…..embarrassed to have had it separate AFTER delivering to a boutique. I also had peppermint essential oil separate, but I think it was an operator FAILure…..Shila told me that I didn’t cook my soap long enough and I think she was right. I love the liquid castille base and look forward to selling lots of it. So any info you pass along will be more than appreciated! I have had good success with Sweet Pea FO. So excited and can’t wait to meet the Bramble Boy! I love the idea of having all those fun pictures to look back on and laugh. It’s really hard to laugh when those moments are happening sometimes. HA! That so would have been me as a kid too. =) We’ll see if our little one is like yours or like Jasmin’s with regards to that. I can’t imagine going over that long … I feel so uncomfortable now! Another Dr’s visit tomorrow to check all the vitals so we’ll see if I’ve progressed in the 5 days in between visits. You are truly amazing…I think I looked like a sack of potatoes at this pt in my pregnancy, not to mention I wasn’t smiling a whole lot. LOL! LOLOL…this will be the cleanest baby ever, and every day he/she will smell like something else!!! 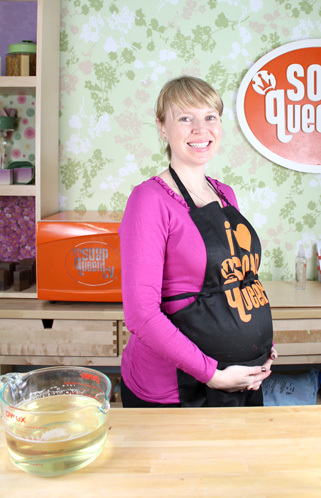 “Today, Bump is wearing Coconut-Mango-Guava.” Congratulations, Anne-Marie! You look great! Not long to go now, how exciting for you both. After the first few mad weeks of parenthood you’ll probably begin to wonder what you ever did with your life before bub came along. Strap yourself in because you are about to start the MOST amazing and exhilarating ride anyone could experience. Looking so well and happy AM, he’s a wonderful bump 🙂 The countdown is on! It came so quickly too! One day, I swear I had months and months to go and all of a sudden, less than 3 weeks! I’m so happy for you, you will be an amazing mother, i’m sure of that! Oh!What a cute baby bump.You look fabulous. Enjoy! Wow congratz and get that suitcase ready to go…. Baby bag is IN the car along with blankets (what if I deliver at the side of the road!). The check list for MY baby bag is at home. Since so much of it I use daily (laptop, Nook, etc…. ), I’m going to have that packed after my water breaks – assuming everything goes according to plan. Ha h … as if that ever happens.